One of the only reasons to go to Best Buy in the city is to stop by El Tonayense taco truck for some tacos. 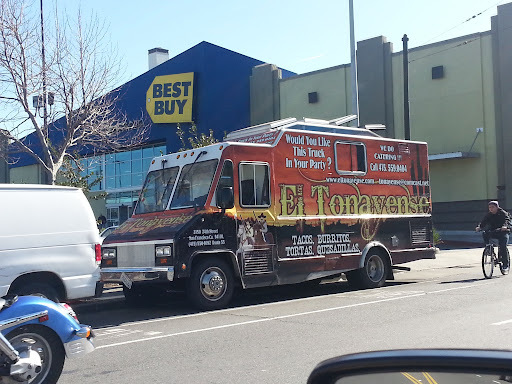 There are actually a El Tonayense taco trucks on Harrison, but the Best Buy location makes for an easier parking option. 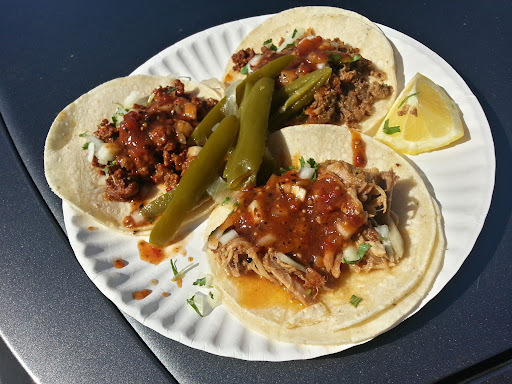 Unlike most taco trucks and food trucks, El Tonayense is guaranteed to at this location whenever your taco cravings occur as long as its M-Sun 9a-9p. El Tonayense is probably one of my favorite taco trucks in the city because the food is consistently good and I don't have to chase it around the city. 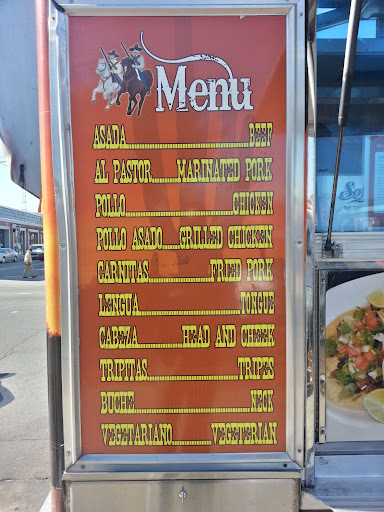 A unique fact is that this taco truck is actually Michelin recommended. Who even knew they rate taco trucks.. The menu includes most of the traditional meats and they haven't caved to the gluten free, tofu craze, yet. From right; clockwise: al pastor, carne asada, carnitas. While all the meats are tasty, my favorite and must order is their carne asada. Juicy and flavorful without any gristly parts, the carne asada always hits the spot. Yes! Josie Baker Bread has finally rooted down a permanent home in the city. 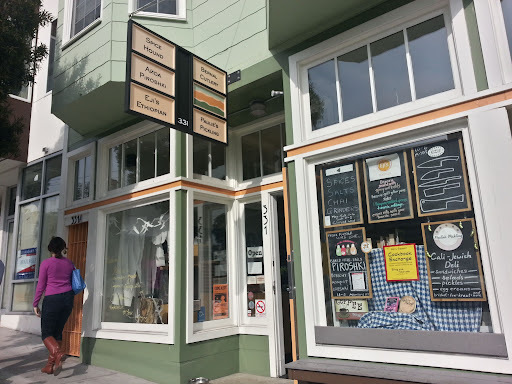 Fresh baked bread (loaves cost $6) and my favorite coffee - Four Barrel in a one stop shop. Less than a month and it seems like everyone else has heard the news of this opening already. 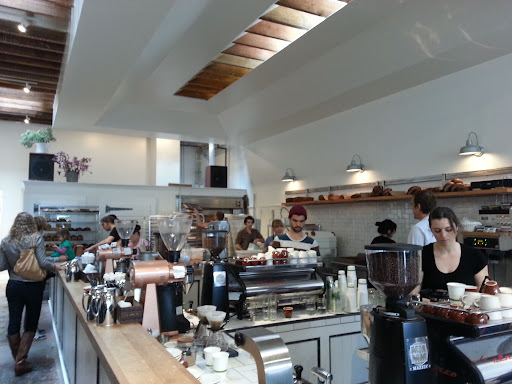 Long lines for the coffee and long lines for the freshly cut toast made on Josie Baker Bread. 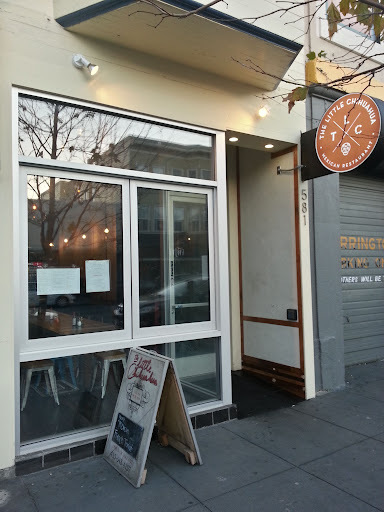 The space is large and open similar to Four Barrel in the Mission. 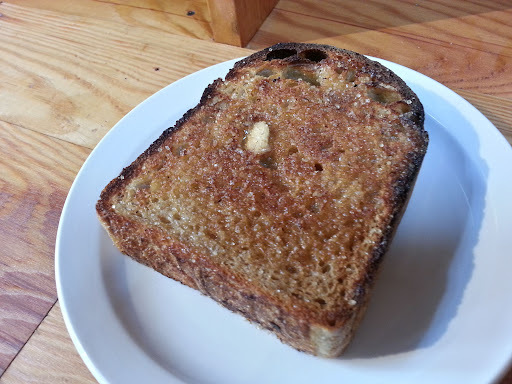 With the menu item specializing in toast and Trouble Coffee's specialty toast (see post HERE), it seems like toast is the new "in" food. That, and toast seems to be a popular hipster food. 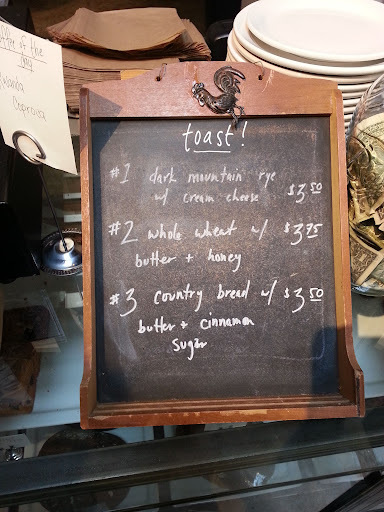 Three types of toast are offered, but you can take home a freshly baked loaf for $6 and make your own toast. The thick slice of country bread with butter and sprinkled with cinnamon sugar is delightful. The bread is fluffy with a springy texture. Each bite has a sour aftertaste similar to a traditional sourdough. Good, but not as good as Trouble's toast, where they lay on butter and cinnamon on thick as if calories don't exist. 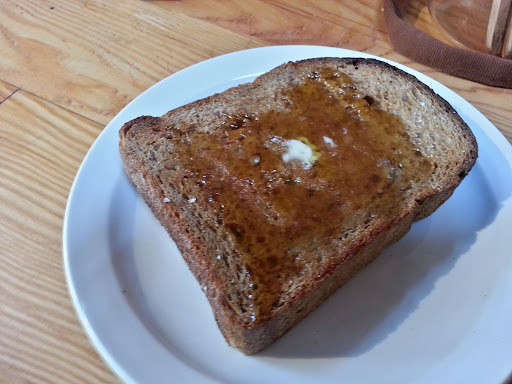 The whole wheat toast is topped with the simple toppings of butter and honey. Again, I wish they heaped on the toppings a little more, but the bread is so good, you just gobble it up anyways. Similar to the country bread, the taste does have a little bite to it. I need to remember to buy a couple loaves for myself and slather on some caloric goodness at home. After many months of waiting, Schulzies Bread Pudding has finally opened. Bread pudding is one of those desserts that either you love it or you just don't care for it. Its by no means the prettiest looking dessert or appetizing sounding, but Schulzies has made even me a little curious. Its almost like New York's Rice to Riches, where they take something plain sounding and tasting and made it flavorful and fresh. The bread pudding here is served chilled and the flavors change daily. Each serving comes with one topping and one syrup sauce. Salted caramel bread pudding served with a heath toffee crumble pieces and whiskey sauce. Yes, thats real whiskey sauce and it does taste exactly like whiskey that highlights the sweet notes of the alcohol. The salted caramel was sweet, but I was hoping for a salted caramel along the lines of Bi-Rite's salted caramel ice cream. Cheesecake bread pudding with caramel sauce, heath bits, and a dash of sea salt. The cheesecake flavor was really delicious with the creamy texture reminscent of cheesecake. I love the sprinkle of sea salt after adding the caramel sauce. 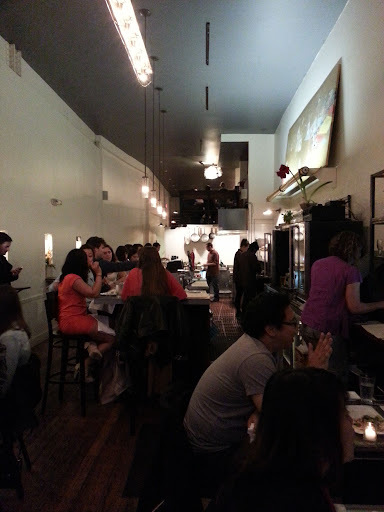 I've been to Bar Crudo way in the beginning when they were located in the very small, quaint space in FiDi/Downtown. Back then it was pricey, but delicious and fresh. 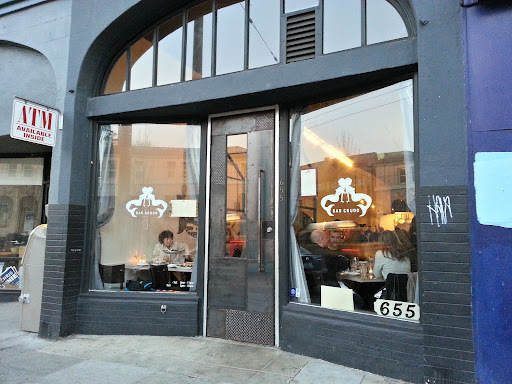 Now they've moved to the NoPa area of SF and added on a irresistible happy hour menu. 7 days a week (yes, that's weekends too) 5p to 6:30p, Bar Crudo does a happy hour for the whole restaurant. Make sure you make reservations at least 2 weeks in advance to ensure a table during those happy hour times. Loud, but they still kept the quaintness of their original location. Seats at the bar are first come, first served. In a city full of amazing bakers and bakeries, the bread here is nothing special. 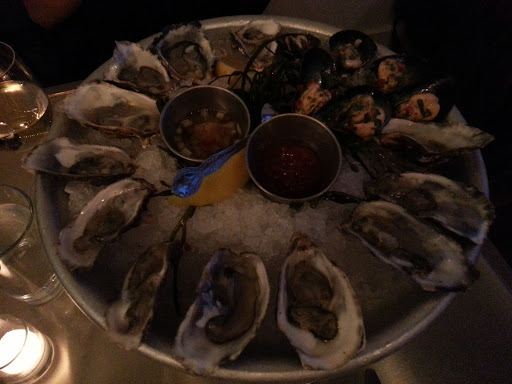 Every day, they choose one type of oyster as their $1 oyster of the day. Today's was Chapman Cove, Washing Oysters. On the medium size, but filled with briny goodness. I've never met a raw oyster I didn't love. Also plated with the raw oysters were the $1 Happy Hour herb & jalapeno marinated mussels. Usually, I don't like my raw seafood too dressed, but the spicy addition to chilled mussels made these bites addicting. $5 pan seared shishito peppers with boquerones, lemon oil, sea salt, and chives. The boquerones were tasty and reminded me of similar ones I've eaten in Spain. Creamy uni with avocado on toast with a frisee salad. I'm a sucker for avocado and with uni, even better. I've had this preparation a couple other places, but this one falls in the middle of all them. Manila clams with smoked paprika, cilantro and white wine. Another happy hour menu item at $5. This preparation of clams never fails to disappoint. I only wished they gave more bread to soak up the broth. The seafood chowder is one of the dishes on the happy hour menu. At $6 a bowl, I think its rich enough to share, but I saw a lot of tables with a bowl for each person. Not exactly a thick chowder and came with a slightly twinge of pink color, it was filled with perfectly cooked fish, mussels, shrimp, potatoes, and applewood smoked bacon. Its not the best chowder I've had, but there is amount of seafood in each bowl. Surprisingly, my favorite dish of this seafood restaurant was the bone marrow. The generous serving of plump, fatty bone marrow was served with a grilled shrimp and squid salad that gave the dish some acidity to cut all the richness from the bone marrow. Yank Sing is one of the dim sum restaurants that populated my Chinese childhood from the huge crowds to playing by the fountain while waiting for a table. They have since raised the prices a lot and knocked a lot of familiar dim sum dishes off their menu and most Chinese have found suitable appetizing and cheaper substitutes, my family being one of them. Although, this visit assured me that some things didn't change, even though the prices have almost doubled, they do still have those etched glass room dividers. One positive thing about Yank Sing is each cart does stop by every table, sometimes repeatably too often, but it beats having to stress out about missing one of your favorite items carting by. Siu mai (shu mai) or pork dumplings are one of the normal dim sum items everyone orders. Yank Sing's are plump and juicy, but a tad bit on the oily side. Har gow or shrimp dumplings are another must order dim sum item. Nothing too special here with a standard shrimp wrapped in a rice wrapper. A little oily. Pot stickers, which I have to say wasn't my choice so I don't get discredited on my ability to order dim sum items. They were greasy, but full of meat. Wu tao or fried tao balls is one of my favorites to order in dim sum. I've always found the fried outside to be delicious as well as the soft inside filling. I've had better since this one bordered on being too oily. Steamed spareribs with black bean sauce. Usually one of the more flavorful dim sum dishes, this one was probably the worst item of the meal. Flavorless and greasy with hardly any meat on the bones and if so, more fat than meat. Yank Sing carts around some somewhat unfamiliar dim sum items that raised my eyebrow when being wheeled by. Lettuce wrap? XLB is another one. While some restaurants do serve it as dim sum, its not really a popular dim sum item. After having some subpar dim sum, I wasn't exactly expecting much when the XLB rolled by. One pinch of the chopsticks to transfer to the spoon showed that the wrappers held firm. A nice amount of soup and a juicy inside made this item the surprisingly only dim sum dish worth getting in this meal. The vinegar to accompany the xlb. Bun Mee is located on Fillmore, which means premium prices on premium property. At almost $7 for a Vietnamese sandwich (banh mi), this place stretches my banh mi budet to the extreme. 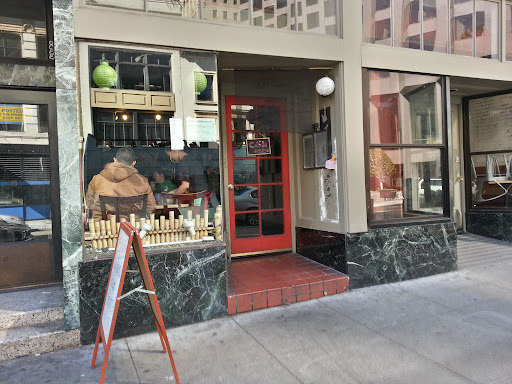 I've walked passed this spot many times with no curiousity to go in, except now, only to strikethrough another item on the 7x7 2013 Big Eat list. It's more fushion than Vietnamese so don't be surprised when you see people ordering a side of fries or sweet potato fries with their banh mi. The restaurant is pretty busy, but not sure how much of the clientele has actually had a real banh mi or knows how much they are really supposed to cost. The sloppy bun looks like a riff off of a sloppy joe with red curry ground beef, house garlic aioli, shaved onion, thai basil, and jalapenos. A fried egg is recommended with this sandwich and no one needs to ask me twice about adding a runny egg to anything. First of all, all the ingredient would seem like it would create a burst of amazing South Asian flavors, but its very bland and a little oily. The jalapeno is spicy, though. Although I think they meant for the fried egg to be runny, it came cooked through. I overheard the expediter saying my sandwich should have had the egg over easy, but to let it go since they didn't want to remake it. Bad execution and bad flavors for a ridiculous price means no thanks. Hanoi style fried catfish with red curry aioli, shaved onion, pickled carrots, daikon, cucumber, jalapeno, and cilantro. The catfish was lightly fried and mild tasting, but smelled like it wasn't very fresh or perhaps previously frozen. Even so, this sandwich was better than the sloppy bun, but that doesn't say much. I had been searching high and low for the last flavor of the holiday Pringles, specifically the White Chocolate Peppermint flavor. Having tasted the other flavors in this release (see post HERE), I was a little bummed that the holiday season was over and thought my hopes of trying this quirky flavor were forever lost. Thanks to an awesome reader who chimed in that this flavor was at Big Lots in the Mission! Thank you! Also, you can't beat the $1 price. The verdict? Funky. Exactly like what you think a white chocolate peppermint would taste like, right down to the minty aftertaste. It seems like every good bakery in the city always has a line out the door. 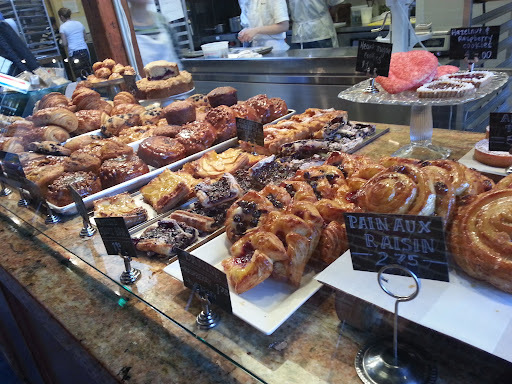 It made me a little hesitant to find no line and not one pastry sold out, but Thorough Bread & Pastry must still be one of those hidden gems waiting to be discovered by the masses. A stunning array of pastries, cookies, and cakes. One of the nicest things to discover about this bakery is the cute backyard patio with outside seating to enjoy your pastries. 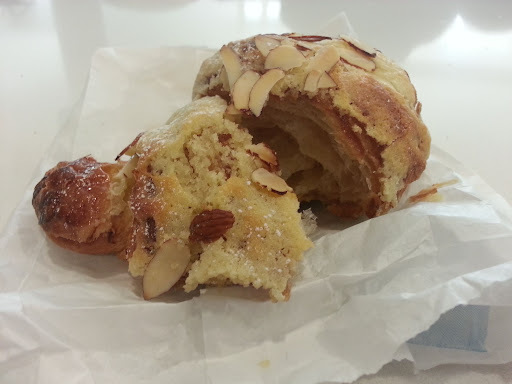 The almond croissants at Thorough Bread & Pastry are buttery and flaky. Topped with slivers of almonds and an almond frosting, they are one of the bakery's signature pastries. Its softer with a subtle taste of almond. Tartine Bakery's almond croissants are still the winner in this category for me, but the no waiting for a still stellar croissant makes it a nice substitute. 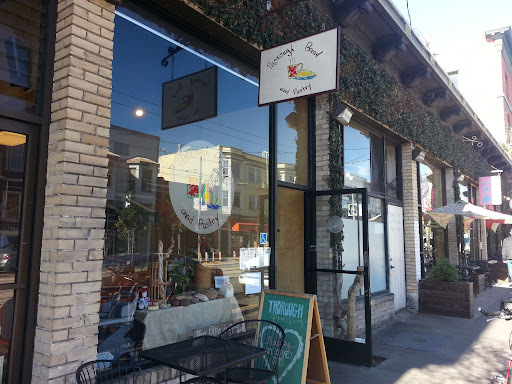 It seems like every neighborhood in San Francisco has their own Italian deli, but the best, of course, is in North Beach. 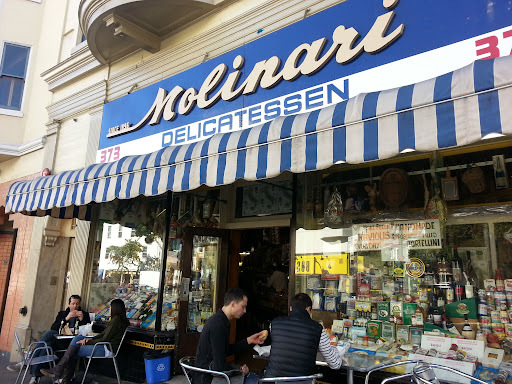 Molinari Delicatessen churns out the best Italian sandwiches. Simple, but satisfying its not a surprise that their take on classic Italian sandwiches is so popular. Similar to Lucca (see post HERE) in the Marina, to order anything here, first take a number. If you are getting sandwiches make sure you walk over to the sandwich bin on the left side of the store and pick out your bread of choice and hand it off when your number is called. 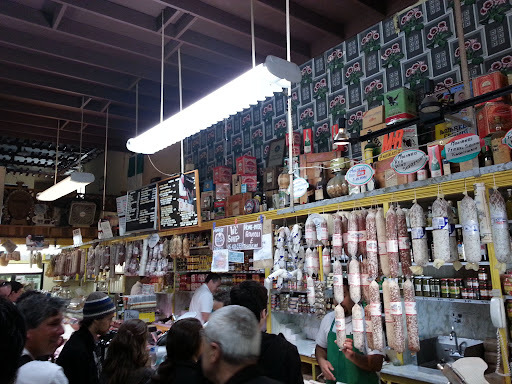 Not surprisingly, the line at Molinari can get atrociously long, but there are plenty of Italian treats like dried salumis, canned goods, and sauces to look at while you are waiting. 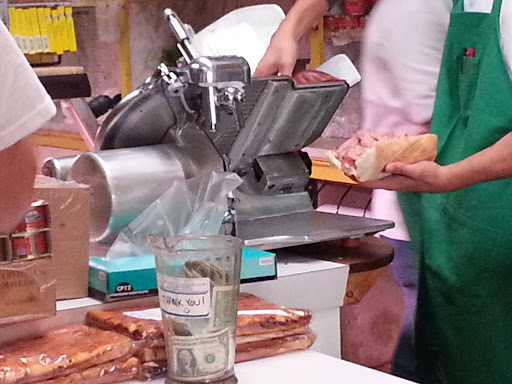 Each sandwich is made with freshly sliced meats. Usually my nose wrinkles a little when I see the words, "sun dried tomatoes", but the Renzo Special has to be one of the few items I've eaten where it works. 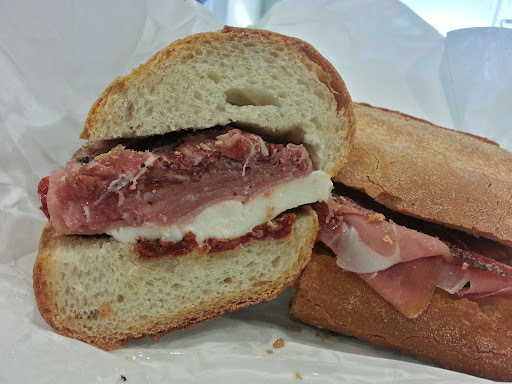 Paper thin slices of prosciutto, coppa, fresh mozzarella, and sun dried tomatoes between your choice of bread is so simple, but amazingly delicious. Not too much meat, the perfect creamy mozzarella, and just a hint of chewy sun dried tomatoes is utter perfection. Though, this sandwich does have a horrible habit of getting stuck in your teeth.. 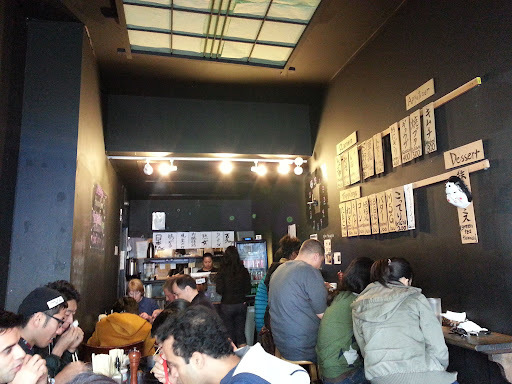 The weather is seemly getting warmer in the city, but Ramen Underground was crowded with people getting their slurp on. The place is really tiny so you'll most likely have to share a table with another party. Ramen Underground serves up the usual miso, salt, and even a tomato ramen. Daily specials like tonkatsu and habanero ramen are limited to 50 bowls a day. It's hard to find good ramen in San Francisco. The closest is usually San Mateo or even San Jose. Santouka (see post HERE) in San Jose is my benchmark here in California. 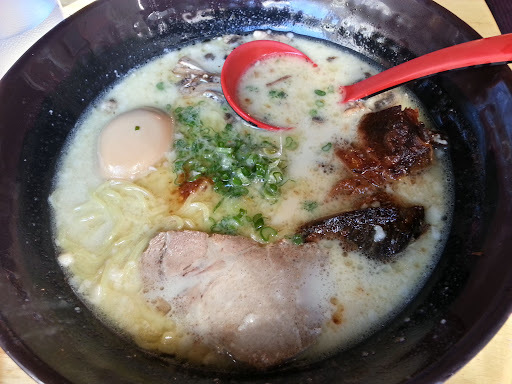 The tonkatsu ramen at Ramen Underground is milky and rich. The pork belly and soft cooked egg are extra, but a nice touch with your ramen. The noodles are chewy and dense and probably the best thing in the bowl. Not the best ramen I've had, but probably one of the better ramen options in the city. The spicy miso ramen has a intense red color from the chili flakes and chili oil, but its not spicy at all. One of the oddest thing about the ramen at Ramen Underground is the addition of thinly sliced mushrooms. I've never seen that before and didn't feel like it added anything to the ramen. The pork belly (kakuni) was too fatty and the meat chunks were a little dry. Also, the slow cooked egg ended up a little too cooked in my ramen. Admittedly, I'm not a huge spicy ramen fan even though I love all things spicy. 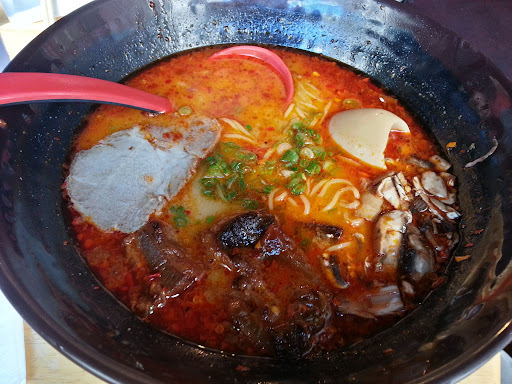 I actually think the spicy ramen at San Mateo's Ramen Dojo (see post HERE) serves up a better bowl. 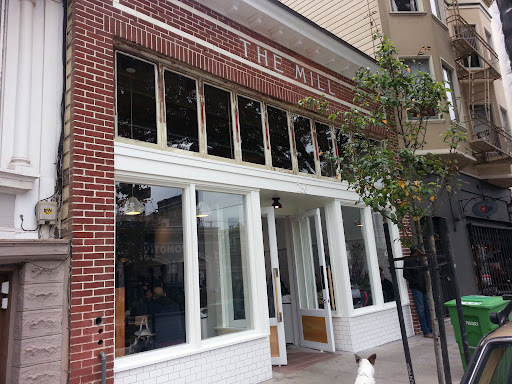 331 Cortland is home to not just Anda Piroshki, but four other food shops. Its almost like a (very) mini Ferry Building. 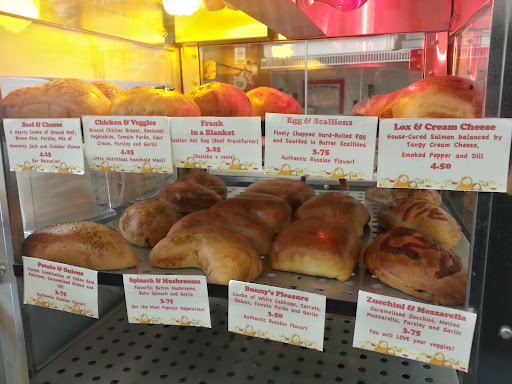 Anda Piroshki sells Russian and Ukrainian delicacies, specifically piroshkis, but they do sell borsch! Piroshkis are sometimes baked, but more commonly fried buns filled with a variety of fillings. Most of the piroshki I've eaten are the fried variety, but at Anda Piroshki, they take the healthier baked method. They come in a variety of stuffings and shapes. 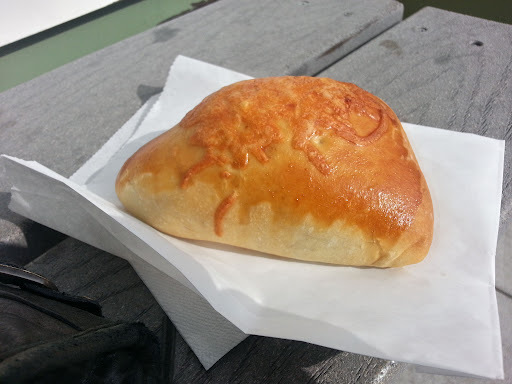 One of the more commonly seen piroshkis are the beef and cheese fillings. Anda Piroshki's piroshkis' are perfectly, fluffy clouds of doughy goodness. I could eat just the outside and be happy. They remind me of Chinese baked pork buns. The inside, however, is a little too salty for me. 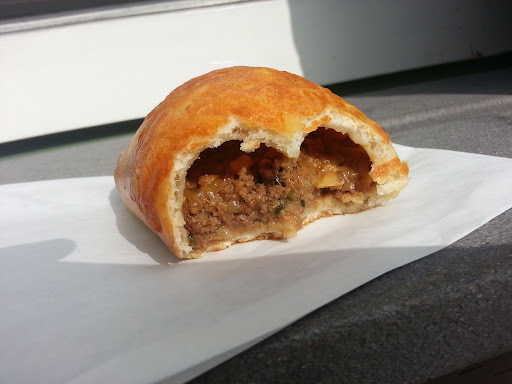 One bite into the beef and cheese piroshki and you can see the bun to filling ratio. Among the variety of flavors, Anda Piroshki shapes their dumplings into cute shapes. 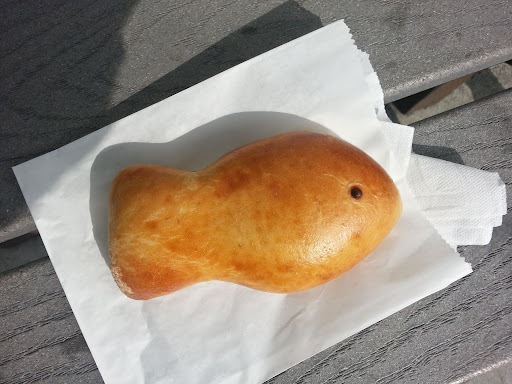 This salmon and cheese piroshki is shaped like a fish! You have to pause a moment to take in the cuteness of the pastry before biting off the head. The bun is similar to that of the beef and cheese with a thumbs up fluffy shell, but a sadly similar salty filling. 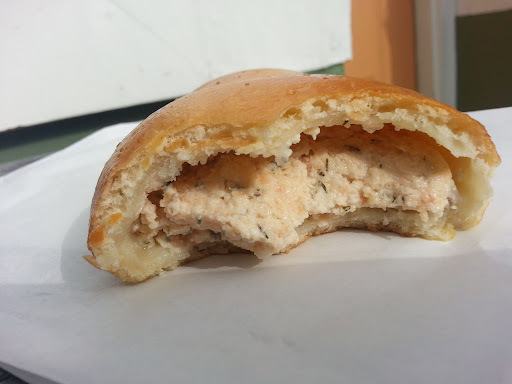 Though, the salmon and cheese piroshki does have a good salmon flavor.